I have been searching all over Calgary for a Greek place where I could get some lamb souvlaki but it seems people around here only care about chicken and veal. Pretty sad or possibly I just looked in all the wrong places however, this was reason enough for me to get frustrated and in the end to try to make it myself, which is not a such a big of a deal. Another complicated part was to actually find a piece of lamb that I liked at my favorite grocery stores which was a bit of a challenge too, only thing I could find were those frozen solid pieces that look like they came right from the Ice Age. It seems everybody likes lamb only on Easter, when every butcher goes on a lamb killing rampage. I was almost this close to upload a cute lamb picture on my website but then I figured nobody will be brave enough to try my recipe anymore so why bother. Anyway, to all the carnivores out there, here how it all went down. Grab a leg of lamb or two from the store because this is pretty much all you can find (except the rack which does not work), trim the unnecessary fat (or not), cut in pieces according to your liking then place it in a marinade for 24 hours before grilling. This is it, it is that simple! Now the marinade is another story but it is nothing anyone can’t handle in their own kitchen, just check my recipe below. After those 24 hours, fire up the grill, thread the meat onto metal or bamboo skewers and go nuts. If they end up looking like mine then you are on the right track, serve them with pita, tzatziki (store bought or homemade) or go check my other site for an AMAZING LAMB SOUVLAKI PIZZA RECIPE. Sorry for the caps but it was delicious believe you me, I ate until I was ready to burst. Enjoy, I know I did! 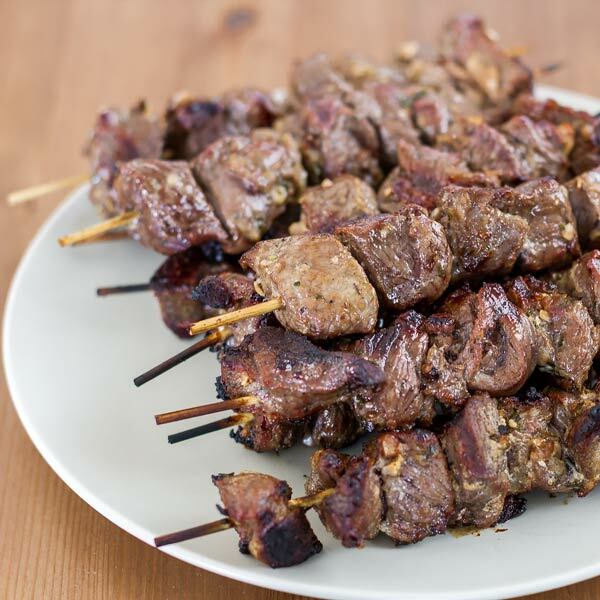 I love Lamb Souvlaki and this recipe looks simple and delicious!